The industry is moving from Qualcomm’s proprietary Quick Charging technology to a unified single charging port. The tech industry is unifying various charging standards into one standard USB Type-C PD (Power Delivery). It makes it easy for device owners to charge multiple devices using a single unified charging port. The USB-C PD chargers can deliver up to 100W of power and can charge laptops and smartphones alike. 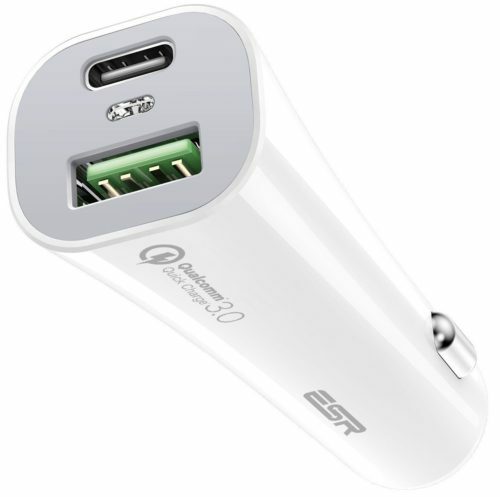 In this post, we will be listing out the best USB C PD car chargers suitable for the latest iPhones, Android as well as laptops which are compatible. Currently, laptops from Apple (Macbooks), Google (Pixel 2), and others follow the standardized USB Power USB-PD specifications. Since Qualcomm dominate the high-end smartphone market, it is easy for them to push their own proprietary quick charging technology. We cannot recommend one over the other, but they are mutually not compatible with each other. It means that if you swap chargers, you might not get the best performance. Google is actively pushing USB-C PD charging and has added a clause in their Android Nougat (7.0) to recommend the USB-C PD open specifications officially. In an earlier post, we have briefly explained what the USB-C PD charger offer and its standardized approach allows interoperability. Now that we understand the advantages of USB PD let us come back to our topic, where we will be listing out the best USB C PD car chargers. All of the chargers mentioned on this list support the new standard and can be safely used across multiple devices which support it. Some of them are backward compatible with legacy devices like USB 1.1 & 2.0. So, here we go! 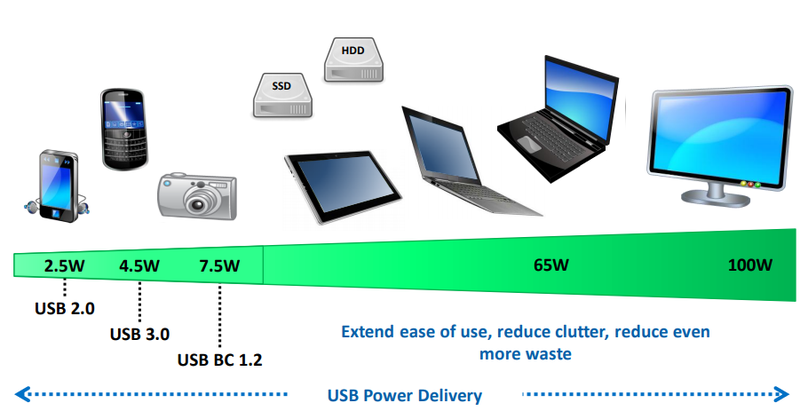 You can charge your USB Type-C phone or bigger USB-C machines with Power-Delivery 2.0. The inbuilt Ai-Power acknowledges the charging specifications of your devices and equals the power output for safe and effective charging. It is harmonious with all USB-C & USB-A powered devices including Android and Apple smartphones, laptops, and tablets PCs. Plus, the built-in safeguards shields your devices against the excessive flow, heating, and overburdening your devices. 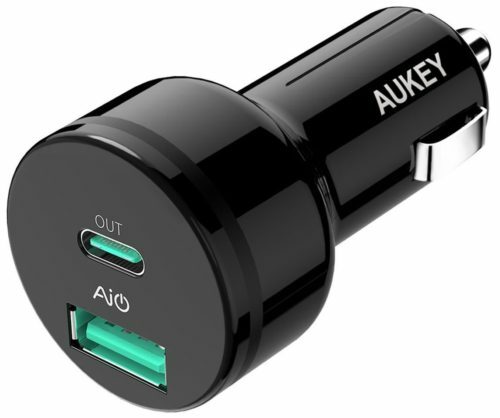 The retail package contains an AUKEY-CC-Y7 Car Charger and a user manual. The Anker car charger comes with an advanced PowerIQ & energy boost technologies that can deliver universal full-speed charging. Do not that this device is not Qualcomm Quick-Charge supported. The charger also comes with a built-in durable Apple’s Lightning cable that ensures that you have access to high-speed charging every time you use it in your car. It comes in a premium design with glowing LED ports and a carbon-fiber finish. The mesh grip strengthens your car’s interior and provides an excellent car charging experience. You get the PowerDrive 2 Elite with Lightning Connector, Installation Guide and an 18-month warranty and an excellent customer service. 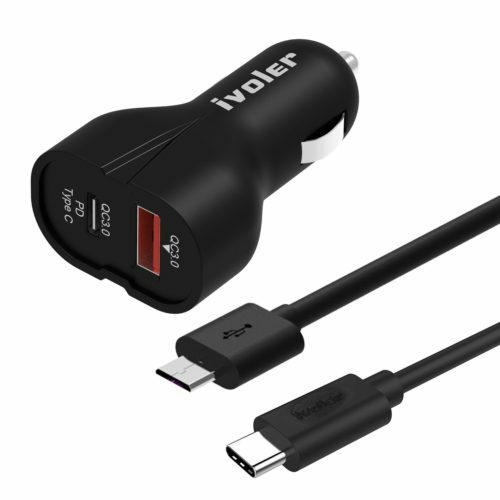 The iVolter charger is an attractive device because it is compatible with both Qualcomm’s proprietary Quick-Charge 3.0 and the standard USB PD. You can charge your USB Type-C smartphone or bigger USB-C devices with Power Delivery or QC 3.0. The USB-C port is outfitted with Power-Delivery & Qualcomm’s QC 3.0 specifications with up-to 3A to load your type c assisted devices. It can charge compatible devices up-to four times faster than normal chargers and 40% faster than Quick Charge 2.0. The car charger from Gearmo is another example of a device that maintains dual compatibility. It works with USB-C enabled phones & tablets, as well as laptops. The total Power output is 60watts over Type C port and 15W over the Type-A port. For QC 3.0, it supports Qualcomm QC 3.0: 12V-1.5A, 9V-2A, 5V-2.4A. Dual-USB Ports Design car charger with USB-C & USB-A ports perfectly combines QC 3.0 & 1 PD port for compatible devices than can charge simultaneously. 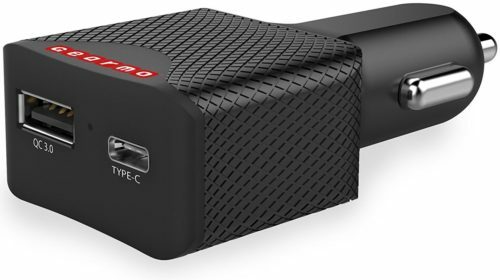 The Type-C port with Power Delivery (PD) provides a maximum of 27W of charging power. The Type-A port comes with Quick Charge 3.0 with speeds of up to 3X faster than standard chargers, producing up-to 18W of charging capacity. It works with all previous Quick-Charge 2.0 compatible devices. The built-in Smart chip can identify your devices, preserving your devices against excessive current, heating, and overburdening. With universal compatibility, it is compatible with Smartphones, Tablets & Laptops and other USB-C devices. 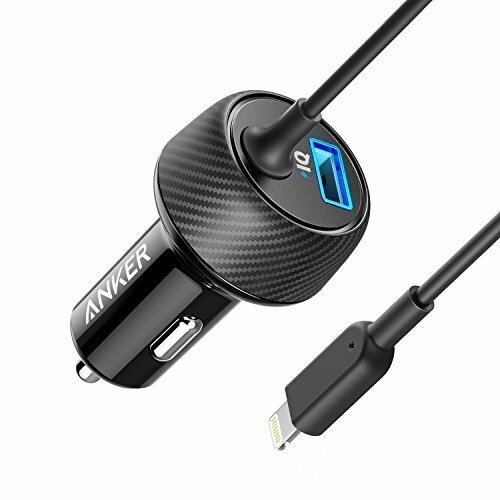 Even though this is not an exhaustive list, it should help you identify the best USB C PD car chargers available on the market. Comments and suggestions are welcome in the comment section below.